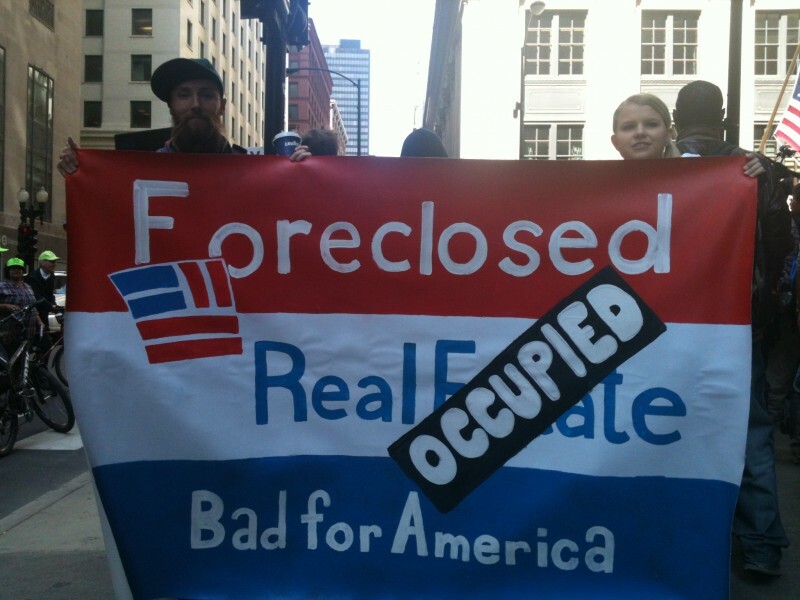 March against foreclosures and evictions leads up to Chicago anti-NATO protest | Fight Back! 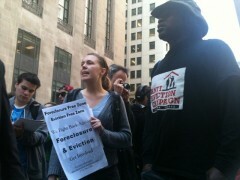 Occupy protesters oppose home foreclosures. 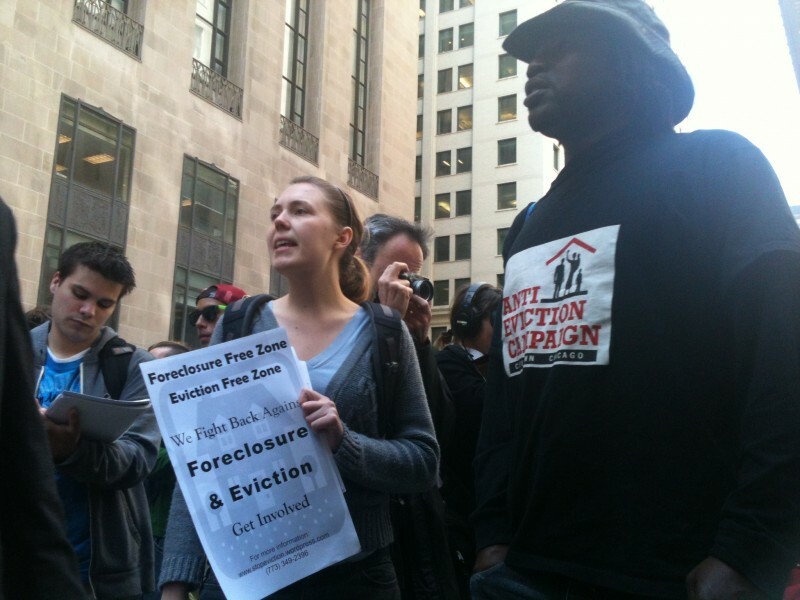 Chicago, IL - Over 150 marchers gathered at the Federal Reserve Bank of Chicago May 16, to march against home foreclosures and evictions. They chanted, “Banks got bailed out, we got sold out!” and young people from Occupy Wall Street held signs saying, “No more foreclosures.” The protesters marched through the streets, stopping outside corporate banks that benefited from the Wall Street bailout, but which continue to foreclose on working people’s homes. Protesters were greeted with smiles and delight. Construction crews stopped work to wave and passersby in Chicago’s Loop shouted support from across the street. Curious onlookers came out of buildings to grab leaflets, or stood by their office windows and watched out of glass lobbies, as police scurried to keep up with the marchers. This is one of several protests opposing war, poverty and oppression leading up to Sunday’s big rally and march against U.S. war and NATO. Upon arriving at Daley Plaza the leaders of the protest began singing “Our house! In the middle of the plaza!” to the popular tune by the 1980s ska group Madness. A crowd then gathered to watch a play portraying the intimidation and oppression that happens every day in Cook County, Illinois. Actors, young and old, Latino, African American and white performed a foreclosure and eviction scene with the banker demanding his payment, ordering the sheriff to throw a family out on the street. The use of heavily armed sheriffs to evict people across the country traumatizes children as well as adults. JR Fleming with the Chicago-based Anti-eviction Campaign said, “This is not a housing crisis. This is a human rights crisis! Third World poverty conditions exist right here in Chicago. We need a one-year moratorium on foreclosures. We need to bail out the people instead of Wall Street.” The crowd then did a call and response chant, “Moratorium! Moratorium!” Fleming explained they want a one-year moratorium, effective immediately. Jorge Ortiz with Communities United Against Foreclosures delivered thousands of petition signatures to a spokeswoman for Cook County Sheriff Tom Dart. Dart’s spokesperson tried to deflect the issue of foreclosure and evictions by talking about Sheriff Dart’s support for legal protections for renters. Ortiz said, “dialogue was continuing” but some angry protesters began to shout, leading the Sheriff’s spokesperson to exit the small stage quickly. The rally ended with calls for more protests, including the big rally at Petrillo Bandshell in Chicago’s Grant Park at 12:00 noon on Sunday, May 20. The speakers list includes the Reverend Jesse Jackson, Los Angeles Chicano leader and target of FBI repression Carlos Montes, Students for a Democratic Society and Iraq Vets Against the War. Then the crowd will march to McCormick Place, where the NATO war-makers are meeting. The military veterans plan to return their medals in protest of U.S. and NATO wars.